We work with companies in the digital technology sector to deliver programmes for your staff which meet company needs. The Network is grant-aided from the National Training Fund so that companies can avail of subsided fees for training and education courses. We host free seminars and networking events for management and staff on topics of relevance to the sector. Whatever your background, find your Future in Tech! Check-out some testimonials from women who have completed the KickSTART programme. 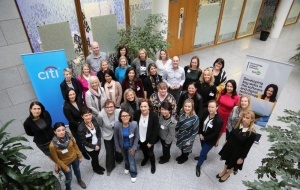 With enormous thanks to Dell Technologies for hosting our first KickSTART programme for women. A packed day of top companies presenting work placement opportunities to the talented Women ReBOOT group.